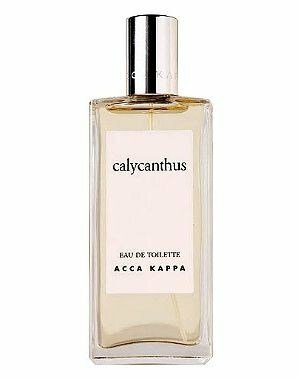 Calycanthus is a perfume by Acca Kappa for women and was released in 2003. The scent is floral-spicy. It is still in production. I do not know calycanthus, I have not had the pleasure to smell it - and I do not think, that I would forget it, if it happened. CALYCANTHUS all along gives me the feeling, that I know the notes very well, it is easy to analyse and easy to understand - but it is more difficult in fact. All what I can detect at the beginning is a green lilly-of-the-valley. Charming and cute, innocent. Green has many shades, this one is light as aloe vera or cactus. Unfortunately there is a synthetic power in the fragrance, that goes out to patrol and discourages people who probable would be attracted by the gentle and gleeful beginning. It also gets way too sweet. For the base I get back a citric green freshness, with a bunch of flowers, but I would not like to force myself to deal with heart notes till that. CALYCANTHUS is clearly dedicated for women, rather for young than for old. Endurance is excellent, radius is also good. Calycanthus is a beautiful and refreshing interpretation of an old English garden. My childhood home is built on 4 hectares, 2 hectares being an English garden complete with white gravel paths, archways and a vineyard. Calycanthus takes me back there. It opens quite strongly with sweet, dewy jasmine and orange blossom. There's also a rather green feel to this fragrance, making it smell like a natural bouquet of flowers rather than a perfume. As it develops a sweet powderiness begins to show. It doesn't overpower the composition, but it does however give Calycanthus a clean-like quality. This fragrance is all about sparkling florals and sweet honey. It's not particularly unique, but it is distinctive. A wonderful Spring fragrance in my opinion. This fragrance is pretty, feminine, fresh and lasting. It may be niche, but Calycanthus is not a fragrance so daring that it can't be worn by perfume novices. I do believe that a majority of people will enjoy this fragrance, one reason being that it's a nicely composed jasmine scent, one that doesn't overpower or turn rancid on the skin. Write the first Review for Calycanthus!